Meah Copeland slowly and carefully guided the crochet hook as she finished the last chain. She examined her creation — a small hat. Meah smiled; the six-hour process was worth it. She had never done this before. 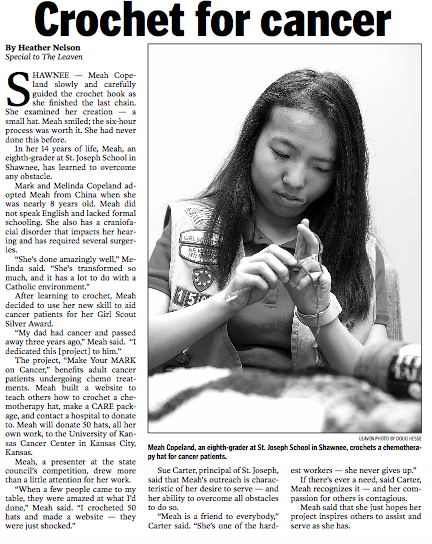 In her 14 years of life, Meah, an eighth-grader at St. Joseph School in Shawnee, has learned to overcome any obstacle. Mark and Melinda Copeland adopted Meah from China when she was nearly 8 years old. Meah did not speak English and lacked formal schooling. She also has a craniofacial disorder that impacts her hearing and has required several surgeries. After learning to crochet, Meah decided to use her new skill to aid cancer patients for her Girl Scout Silver Award. The project, “Make Your MARK on Cancer,” benefits adult cancer patients undergoing chemo treatments. Meah built a website to teach others how to crochet a chemotherapy hat, make a CARE package, and contact a hospital to donate to. Meah will donate 50 hats, all her own work, to the University of Kansas Cancer Center in Kansas City, Kansas. Meah, a presenter at the state council’s competition, drew more than a little attention for her work. Sue Carter, principal of St. Joseph, said that Meah’s outreach is characteristic of her desire to serve — and her ability to overcome all obstacles to do so. If there’s ever a need, said Carter, Meah recognizes it — and her compassion for others is contagious. Meah said that she just hopes her project inspires others to assist and serve as she has. i would like to see Meah’s website to learn how to crochet her cancer hats. I need login assistance. Thank you.